While setting up a call center, the businesses need to focus on managing both inbound and outbound calls efficiently. The inbound calls are made by a customer or prospect to gather specific information or resolve a specific problem. The outbound calls, on the other hand, are made by a call center agent or salesperson to an existing customer or prospective lead to promote and sell products/services. The call center dialers are specialized software applications which are designed with features to automate outbound calls. The call center dialers can be broadly divided into two categories – manual dialers and automated dialers. The manual dialers lack the features required to launch and manage outbound voice call campaigns efficiently. Hence, no modern call center these days uses manual dialers to handle high volumes of call. Unlike manual dialers, automated dialers do not require agents to put extra time and effort to dial the telephone numbers one by one and updating records after wrapping up the call. In addition to dialing telephone numbers from a database automatically and sequentially, the automated call center dialers have the capability to detect busy tones, answering machines, voicemails, unanswered calls, and disconnected calls. Hence, they transfer only answered calls to a live agent or an interactive voice response (IVR) solution. The call centers leverage automated dialers to make agents more productive, increase agent talk time, and reduce agent idle time. The call centers have option to choose from a variety of automated dialers according to their precise outbound communication needs. The preview dialers deliver contact records to outbound agents individually and automatically. But they allow the agent to review the contact details before calling a customer or prospect. The on-time access to customer information makes it easier for the agents to personalize customer interactions and keep customers engaged. Also, the preview dialers dial telephone numbers automatically based on specific outbound marketing campaign setting. The agents even have the option to skip specific telephone numbers on the list. Many call centers leverage preview dialers to deal with complex sales. As the agents can access the updated customer information, it becomes easier for them to conduct the research required to engage the leads and close complex sales deals. However, the call centers cannot use preview dialers to make agents initiate more outbound calls. The progressive dialers dial the next number on the contact list automatically and immediately after the agent wraps up a call. They initiate outbound calls as soon as the agent is available to handle the next call. The modern call centers use progressive dialers to reduce wait time between calls. The progressive dialers even make agents more productive and enable them to handle more outgoing calls in a short amount of time. The progressive dialers further make agents respond to only live calls. The agents even have the option to review customer information as the progressive dialer keeps dialing telephone numbers sequentially. Many call centers these days use progressive dialers to make agents handle outbound calls which are very similar in nature efficiently. Unlike preview and progressive dialers, predictive dialers use dialing algorithm to decide when an agent will be available to handle the next outgoing call. They even dial telephone numbers automatically and sequentially based on the prediction. Also, they have the capability to detect busy signals, answering machines, voicemails, and disconnected calls. The call centers these days leverage predictive dialers to improve agent productivity and streamline outbound campaign management. The cloud-hosted predictive dialers can be integrated seamlessly with ERP and CRM systems. They even help managers to assess call quality by monitoring live calls. But the call centers cannot leverage predictive dialers fully without deploying adequate outbound agents. If no agent is available to handle the answered call, the call abandonment rate will increase significantly. At present, predictive dialers are being used widely by outbound call centers. Unlike predictive dialers, power dialer or rapid dialers do not predict when an agent will be available to handle the next outbound call. They dial the next telephone number on the list automatically and instantly after the agent wraps up the previous call. These automated dialers have the capability to detect busy, disconnected, and unattended number. When the power dialer detects a live call, it connects the customer or lead to a live agent automatically and instantly. But power dialers do not transfer or route the live calls to outbound calls. They require the agent to be live and available to handle the answered calls. The feature makes it easier for small businesses and start-ups to run outbound marketing campaigns without deploying additional agents. Many call centers these days leverage power dialers to work with remote agents. But the call centers cannot use power dialers to handle high volume calls. Unlike on-premise call center dialers, hosted auto-dialers are deployed in the cloud. They run on a remote IT infrastructure provided and managed by the cloud-service provider. Many call centers migrate from onsite auto dialers to hosted auto dialers to reduce upfront and ongoing infrastructure cost. They even have the option to avail predictive dialers, progressive dialers, preview dialers, and power dialers hosted in the cloud. 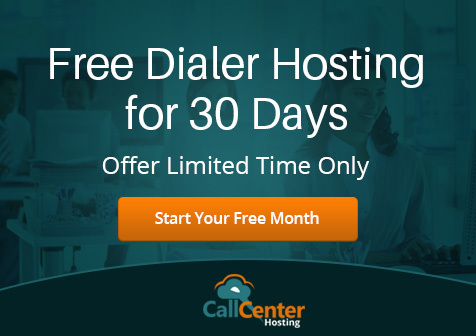 The hosted auto dialers even come with features to sophisticated features like call transfer options, intelligence detection, contact list management, real-time reporting, time zone management, and campaign control. These features help managers to enhance agent efficiency and generate more leads consistently. The businesses can further use the hosted auto dialing solutions for promoting products/services, generate more leads, run political campaigns, deliver service/event notifications, and run press-1 campaigns. The call center dialers are software applications that automate outbound calls. A call center has option to choose from a variety of auto dialers. Most call centers nowadays prefer hosted auto dialers to on-premise dialers to leverage benefits in terms of cost, flexibility, scalability, and security. The customizable and extensible nature of hosted call center dialers even helps businesses to modernize their outbound call center operations and improve omnichannel customer experience. Some Recent Acquisitions That Have Made News In Call Center Industry What Are The Major Differences Between Traditional and Hosted PBX?